That teacher should have had some consequences for actions like that against a student. Luckily it never happened to me. I don’t know if I would have been as strong as I know Dan Savage is. I would have been ashamed – a great lesson to teach a young person. It’s funny, many top chefs are men, yet as a culture we ridicule those who don’t follow the norms of masculine and feminine. Shame on us. There was an article online recently about a young girl who wrote to the Easy Bake Oven people asking why there wasn’t a version with more “gender neutral” colours so she could get one for her brother. That young lady is going to grow up to be a fine young woman. Nobody (yet) today has the luxury of an EB-Oven in, say, yellow and orange. But lack of childhood toys aside, here I am today, baking up a storm. Today’s recipe proves how far down the rabbit hole I have gone. I was reading a board talking about autolyse dough on thefreshloaf.com a few days ago. That's the best site I know for all things bread. I guess I’ve got it bad. I’ve spoken about autolysed dough before when I made French baguettes. The BEST baguettes I’ve ever made, by the way. Search this site for “baguettes.” It’ll pop right up. In case you haven’t read that post, autolyzation is “self digestion.” It refers to the process of mixing water with flour and letting it sit. 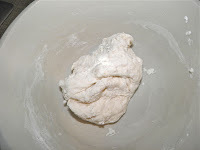 This has the effect of changing the flour and arranging the gluten strands as though the dough was kneaded. The theory goes that bakers from times past didn’t have the mechanical means – or the time – to knead the heck out of 50 pounds worth of bread dough every day. So there was another process used. Autolyzation. It sounds “fancy” but it’s just another technique, like proofing yeast or shaping bread. kneaded for 2 minutes, just to bring it together before it sat. The results using this technique are stunning. You don’t cramp your arms and you get delicious bread with lots of good crumb and holes. You know, bread the way you always wish it was. Being lazy at heart this technique is precious to me. I went one step further than usual with this recipe. On the same board, other posters were talking about why bread often doesn’t turn out as it should. The secret was moisture content. A poster* (who I trust from previous experience – that site is amazing) said hydration of your bread should be somewhere between 60%-70%. That’s very wet dough. So for this recipe I actually measured the weight of flour and water and made mine fit the criteria. The result is what you see. As a bonus, most of the “work” was done when I was asleep. I kneaded for 2 minutes, total. I’m no baker and I made these. If I can, so can you. Just think how impressed guests will be if you place these loaves on the banquet table this holiday season! 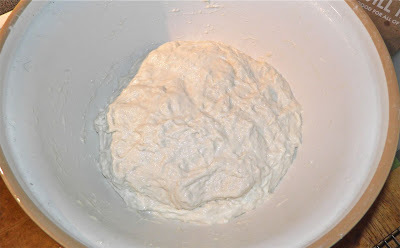 Mix the preferment ingredients together in a bowl. Wrap with plastic, cover and set in a warm place overnight or at least 8 hours. Mix the autolyse ingredients in a separate bowl. Cover and let sit on the counter overnight as well. In the morning,mix together the booster and let the yeast proof for 15 minutes. Tear the preferment apart into pieces and spread it on top the autolysed flour/water. Then add the booster and knead with your hands until it comes together. It will look very, very wet. 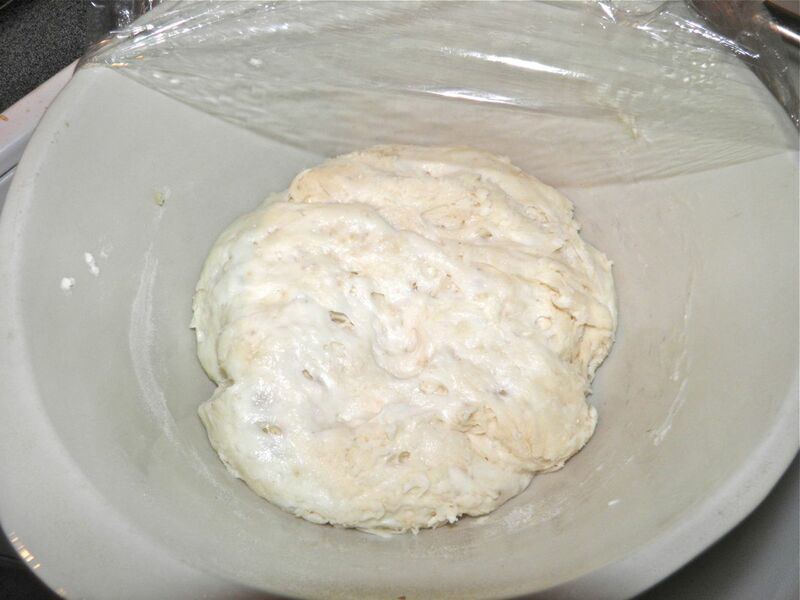 Let the dough rise for 3 hours. When you look in the bowl you will have a very wet, bubbly mass. Don’t worry. That’s perfect. 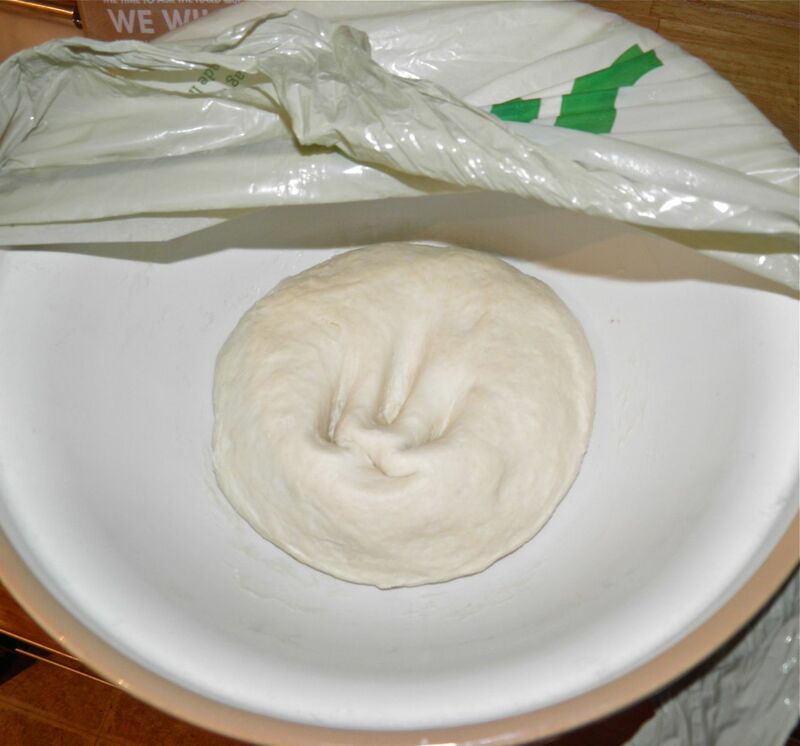 The next step seems impossible when you look at the dough in the bowl, but it will come together. Liberally cover a work surface (and your hands) with flour. Pour the dough out onto the floured surface. 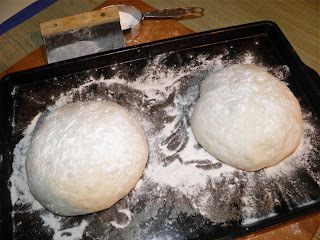 Using a dough scraper, fold the dough up over itself a few times until the dough *just* no longer sticks to the surface. It will still look almost too wet to work. medium sized holes, and the crust is "crunchy good." Divide in two pieces. With well floured hands, flatten each piece of dough into an oblong. Roll up, flatten and roll up again. Then take your hands and cup under the dough to make a round shape. Do this until it retains a round shape. Place the loaves on a very well floured baking sheet (or sheets). Sprinkle the tops with flour. Cover with plastic and let proof again for 1 hour. 20 minutes before you’re ready to bake, turn the oven to 475°F and place a pan of water on the lower rack. 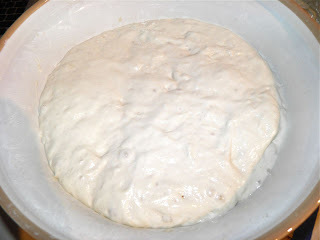 This will add the moisture in your oven the bread needs to rise when it first starts to bake. 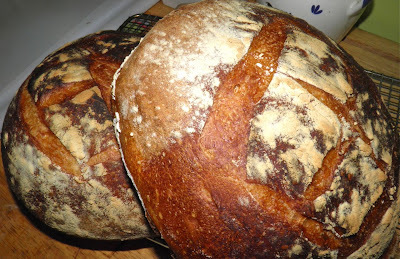 Just before baking, slash the top of each loaf as you wish (see picture for what I did). Bake for 30-40 minutes, removing the water after the first 10 minutes. At the end of baking the loaves will sound hollow when tapped and will be a nice dark brown. Let cool on a rack. As it cools the crust will crackle and snap merrily. Serve with softened butter. * Talk about six degrees of separation. The poster I refer to above (I believe he moderates thefreshloaf.com boards) has just posted that he won't be posting for a while. His granddaughter was one of those innocents killed in the Sandy Hook Elementary School massacre. My heart goes out to him and his family, as well as all the others. Hey, I just wanted to say thanks for the recipe! I've been stalking your blog and pinterest board for a while - pretty good job you're doing! So yesterday I finally decided to give the autolyse method a try - and it turned out just perfect! 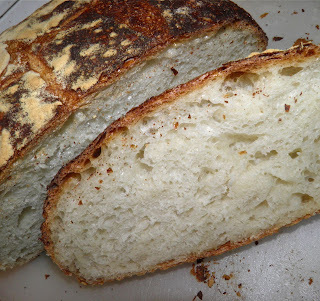 Even though during the process it looked almost doomed... the final result was amazing, just as soft on the inside and crunchy on the outside as promised, and such a simple and subtle taste. Baguettes are to follow!